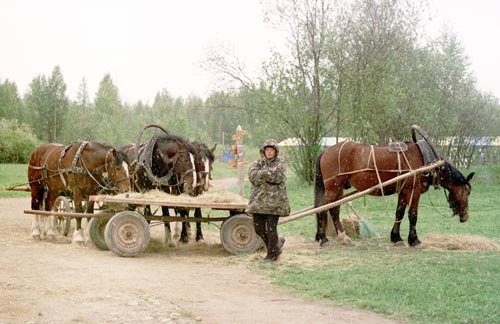 The Pechora moose farm was a foregoer of the Kostroma farm. The farm still exists as a scientific laboratory and a tourism center. Photo by A.Satsuk, the director of the farm (himself, with Ada, 2004). 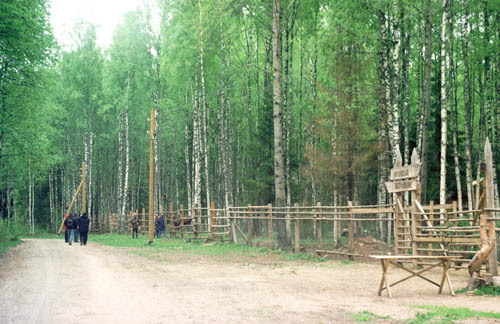 The moose research station of the Elk (moose, of course) Island National Park, 2 km from Moscow border. The territory of the park is used for recreation by Moscow inhabitants, over 26 thousand people in the daytime. 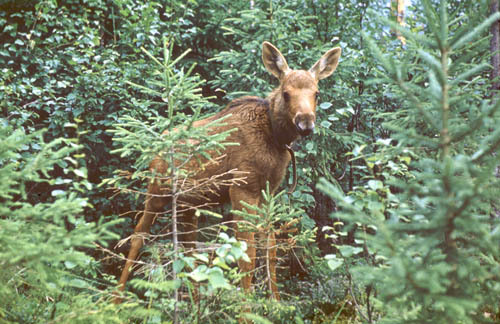 Some of them, daring to enter unfordable Yauza marshes, have a chance to meet tame moose with radio collars. 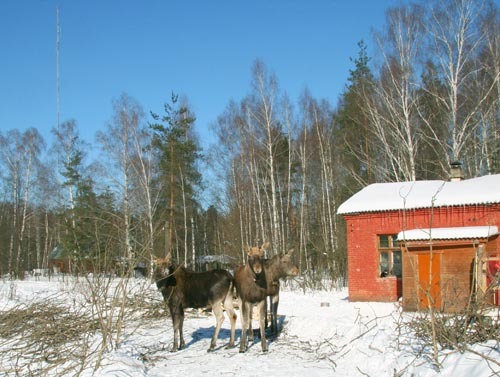 Some of our hand-reared moose prefer to spend winter on the station near food troughs. 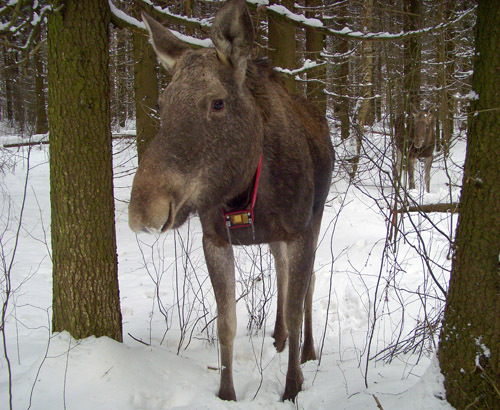 Like on Pechora and Kostroma farms, moose can spend some periods free-ranging or leave the research station for ever if they want. They give birth and raise their calves as wild moose. We know all about their movements because they are equipped with radio tags. The radio collars get position data by means of GPS receivers and send us messages (SMS) through GSM cellular network. 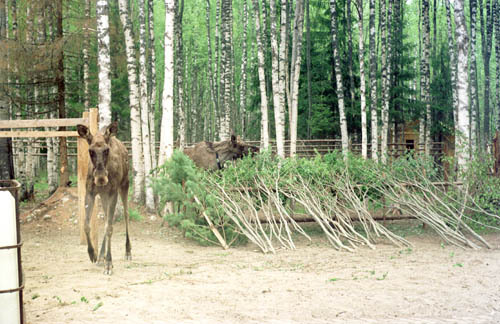 The moose research station is situated in the «reserved» area of the national park, near the main gamekeepers' base. Sika deer prefer to spend winter and early spring near troughs on the base, but hide in the deep forests near Yauza marshes all through the summer. 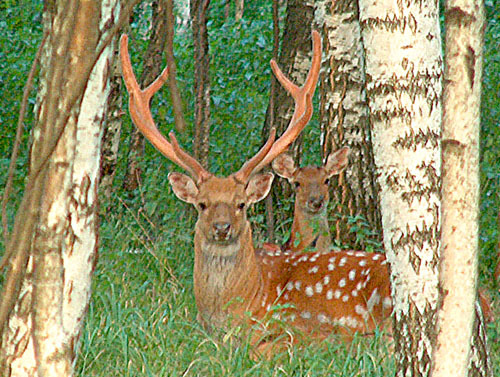 Sika deer is regarded as one of the most beautiful deer on the earth along with fallow deer and axis. 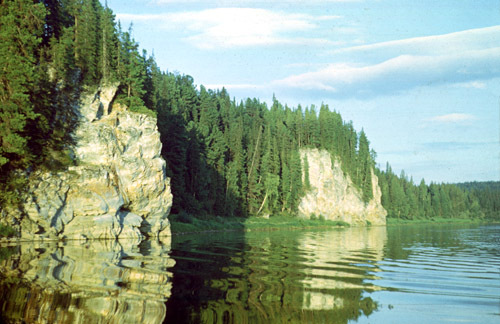 The Green Haven, a landing place on Svir River in Leningradsky region. 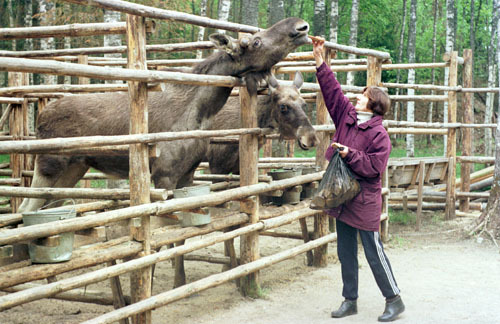 A moose farm was established as a tourist attraction alongside with vodka museum, horse riding and folk souvenir factory and shop. After some years of «prosperity», the vegetation inside small enclosures degraded, though moose were fed ad libitum. Falling trees released the animals who left the farm one by one and never returned. Now on its site one can see a map with a word moose, but I'm not sure that at least one moose left there. 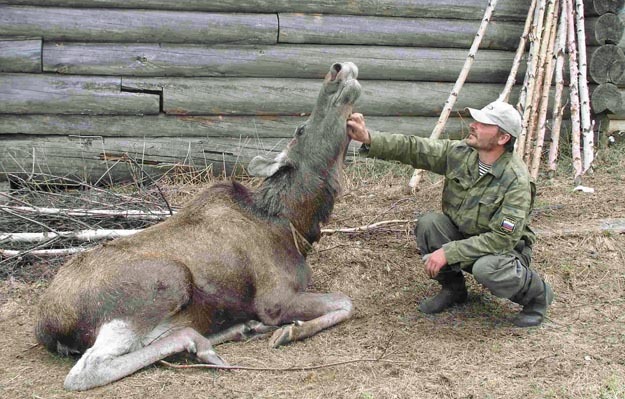 A new moose farm in Tumen region of Russia. 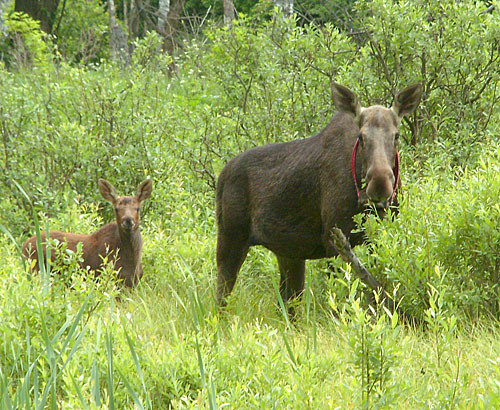 In 2008, nine calves and 3 adult animals from the Kostroma farm became a basis of the new domestic moose population. Three bears in Karelia, a small zoo and a tourist hotel. It seems that no moose left here. Algenshus in Sweden. Not only moose milk, but also moose cheese. Vittangi Algpark in Sweden. "The park is being phased out" is written on this site. 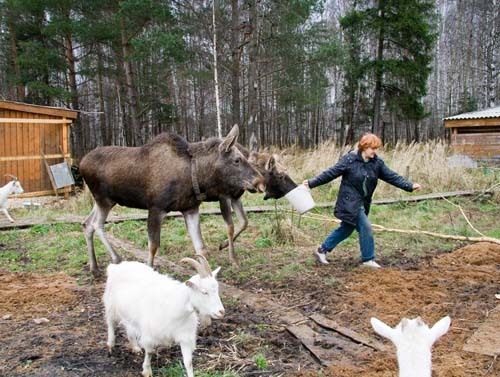 Moosegarden in Sweden. A well-known tourist attraction. Losiowa Dolina (Moose Valley) in Poland. One more tourist attraction, a little bit risky, breaking rules of safe work with moose. Judging from the photographs, a visitor could be involved in moose games or conflicts and be hurt on occasion. Moose is a very strong animal and can traumatize a man unintentionally. Hirvikartano (Moose Manor) in Finland. Another tourist attraction. 2 young moose cows and a male moose in captivity since 01.01.2009. 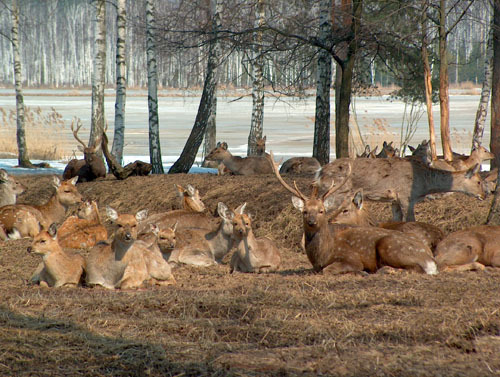 Elch und Rentierfarm (Moose and reindeer farm) in Germany. A tourist attraction. 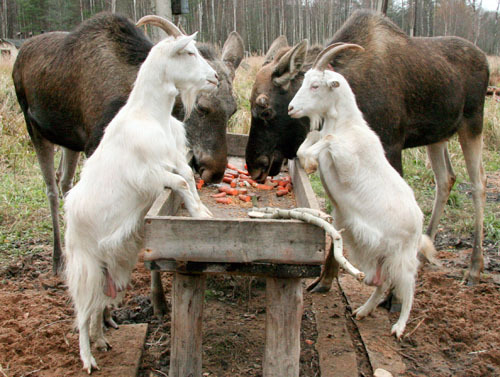 Breeding moose, reindeer, wapity, moufflon and fallow deer for sale. Deer in the yard. Though they are not moose, I place a link here. I think this is the best example of peaceful coexistence with wild nature. 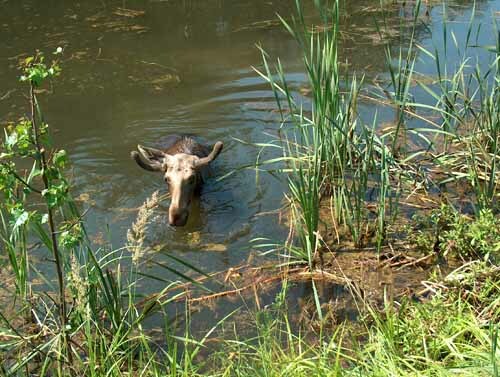 For general information see Mooseworld - the most comprehensive Internet resource about wild moose.